Sudbury’s outgoing Mayor, Cllr Sue Ayres, chose Kernos as one of the local charities to which she lent her support during her 2016/17 term. The donation amounts from various fund-raising events that took place during Cllr Ayres’ 12-months in office were subsequently split between her nominated charities, with the share that the Kernos Centre has now gratefully received coming to £976. 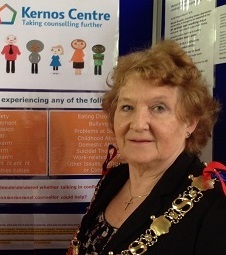 Finding local, long-term financial support can prove problematic, so this funding is good news for potential clients of Kernos, since every penny allocated to the Centre from the Mayor’s fund will go to help the provision of the professional counselling and support for people in Sudbury and the surrounding area suffering from debilitating emotional and psychological difficulties. A welcome funding contribution of £450 has also recently been received from Great Cornard Parish Council, continuing the generous support that this local authority has provided in previous years for the Centre’s Suffolk-based clients.